If you want to learn how to make money with a blog, then you've come to the right place! I started my blog in August of 2011, and it’s something that has completely changed my life. Back then, I never thought about making money blogging. I don't think I even looked into how to make money with a blog back then, as it was never my goal. I certainly never thought blogging would drastically change my future, but I’m so glad I gave it a shot. 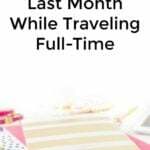 Blogging has allowed my husband and I to leave our day jobs, travel full-time, see family and friends more, meet great people, and have one heck of a great life. How To Start a WordPress Blog on Bluehost – This article shows you how to create a blog. If you are interested in starting a blog, you MUST read this. My Monthly Online Income Reports – I show you exactly how I earn a living each month along with valuable tips to help you along the way. Why You Should Start a Blog – So Many Positives! – There are many benefits to starting your own blog. Check this out if you don't believe me. 9 Helpful Blogging Tips For New Bloggers – Here are my tips for after you start a blog. The Ultimate Guide On How To Start a Blog – Here, you can find ALL of my blogging-related and how to make money with a blog articles in one organized place. Below is my ultimate guide on how to make money blogging. I have answered the most common questions that I am asked about making money blogging, and hopefully all of you can start a successful blog as well. If you want to make money blogging, the first thing you will need to do is make sure you have a self-hosted blog, such as through Bluehost. I recommend you start on self-hosted WordPress (this tutorial will help you start your blog the correct way). I cannot say this enough, but I do not recommend Blogger or WordPress.com (you want the self-hosted version, which is WordPress.org – confusing, I know). Buying that $10 domain name from Blogger or GoDaddy does not mean you own it either. Advertisers, companies, and readers will know you are still on Blogger or free WordPress, which can look unprofessional. Plus, your blog can be deleted at anytime and for no reason when on a free version, and it even happened to me. This can hurt your chances at earning your income online. Seriously, just trust me. Go with self-hosted WordPress, and it will significantly increase your chances of monetizing your blog. If you want further proof, take a look at my past income reports. You can tell that my income through blogging didn’t take off until just as I switched to WordPress. Right there is a lot of proof that being self-hosted on WordPress is the way to go! You have a more professional website meaning you may be able to make more money on self-hosted WordPress. You own your blog, and it can’t be deleted for no reason. If you are interested in starting a blog of your own, I created a tutorial that will help you start a blog of your own for cheap, starting at only $2.95 per month (this low price is only through my link) for blog hosting. In addition to the low pricing, you will receive a free blog domain (a $15 value) through my Bluehost link if you purchase at least 12 months of blog hosting. FYI, you want to be self-hosted if you want to learn how to make money with a blog. Do I need a lot of readers in order to make money blogging? You do not need millions of pageviews per month to make money blogging, but it is something you will want to increase if you want to improve your income. If you want to learn how to make money with a blog, then this is an important step! This is a question I have received many times lately when it comes to how to make money with a blog. Many of you are interested in blogging, but you are not sure where the income actually comes from. You receive blogging income from whoever is paying you. If it is affiliate marketing you are providing, then you get paid through the company whenever someone buys or signs up for something through your link. If someone is paying you to place an advertisement on your website, then you get paid by them. If you have display ads on your website such as with Google Adsense, then you get paid from Google or one of the many other thousands of companies. There are many companies and blogging networks out there who are looking to pay for things on blogs! You usually get paid either through PayPal or by receiving a check in the mail. Can new bloggers make money blogging? There is plenty of room for new bloggers to make money. I’ve had many tell me that they started a blog because of my income reports and that they are able to make money blogging (awesome, right?! ), this is proof that new bloggers are still making money. I also personally know bloggers who started a year or two after I did, yet they are making double, triple, or even 10 times the amount I am earning. The world is a huge place, and the online world is just going to keep growing. Every blogger earns a living online in a slightly different way, and everyone has a different message/story. Plus, there are TONS of different ways to make money through a blog, and I expect this to keep growing. Due to the reasons above, I believe there will always be room for more bloggers. As you can tell from my past income reports, I started earning a few hundred dollars a month from my blog less than one year after I started. After just two years of blogging, I was earning several thousands of dollars from blogging, which was all on the side of my day job. I know some who started making thousands of dollars a month after just a few months of blogging. There are bloggers out there who began a year or two after me and are making hundreds of thousands of dollars a month. There are also other bloggers who aren’t making any money. As you can see, blogging is not a get rich quick scheme. However, if you are serious about it, you never know what it may turn into. What ways can a person start making money blogging? I have further discussed the different ways below. Affiliate income is my most favorite way of earning a living online. Just a year ago, I was barely earning anything from affiliate income, but now I'm earning around $50,000 a month from it! Affiliate income is when you place an affiliate link in a blog post and try to earn money from people buying the product through your link. This can be a good way to make money because if there is a product out there that you love, all you have to do is review the product and hopefully others will be interested in buying it as well. Affiliate income is great because you can create a post, review, etc., and that post may earn you money years down the line with minimal work needed to maintain the article. It can be somewhat passive, which is what I love about it. I believe it’s best to recommend products you believe in. A lot of my affiliate income is from my How To Start a Blog post, because I include everything a person needs to know about blogging in that tutorial. There are many different affiliate programs out there to check out. These include Awin, Max Bounty, OfferJuice, Avant Link, Shareasale, Flex Offers, Commission Junction, Amazon’s Affiliate Program, and so on. If you enjoy a product, there is probably some sort of affiliate out there for it. Use the Pretty Link plugin. I use this for all of my affiliate links. It makes them look cleaner when it looks like “makingsenseofcents.com/bluehost” instead of the long links that affiliate programs usually provide. Provide real reviews. You should always be honest with your reviews. If there is something you don’t like about a product either don’t review the product at all or mention the negatives in your review. Ask for raises. If you are doing well with a particular affiliate program, ask for a raise. The worst thing that can happen is that your affiliate manager says no. The best is that they say yes! Form a good relationship with your affiliate manager. Your affiliate manager can supply your readers with valuable coupons, affiliate raises, and more. Publish tutorials. Readers want to know how they can use a product. Showing them how to use it and how it can benefit them can be very helpful. Have a recommendations page. I always like checking out recommendation pages on blogs. 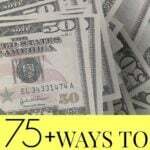 It can be a great way to list valuable products and services that readers may need or want. Here’s mine as an example. Don’t go overboard. There is no need to include an affiliate link 1,000 times in a blog post. Include them at the beginning, middle, and the end, and readers will notice it. Paid blog posts and advertisements are when you place an advertisement on your blog in exchange for money. This might be in the form of a sponsored review, a guest blog post, a sidebar link, an advertisement within a newsletter, and so on. There are many different forms of paid advertisements on websites. You can either reach out to advertisers yourself, sign up for advertising networks (some include Izea, Find Your Influence, or companies/advertisers may find you. There are many, many companies out there who are looking to advertise on blogs, so it is usually relatively easy to find blog sponsorships once you have a website. If you want to learn how to increase your advertising income, I recommend taking my Making Sense of Sponsored Posts course. Learn how I made my first blogging income, and how I'm now making $10,000-$20,000 a month with sponsored partnerships! Display advertising is when you place an advertisement on your blog in the sidebar, below a blog post, below your header image, or in some other location on your blog. Then, for every so many views that advertisement sees, you will earn a certain amount of money. It’s an easy way to make money blogging as all you have to do is insert the code provided to you. In general, the more page views you receive, the higher your income from ad networks will be. You can receive display advertisements for your blog from companies such as Media.net (this is a very popular one) Adsense, BlogHer, AdThrive, and many others. What is Adsense exactly? Adsense is what many bloggers use, as it's very easy and you can input Adsense advertisements on your blog starting from the very beginning. AdSense is an advertising network within Google that allows website owners to place advertisements on their websites. These ads are picked out by Google, and you just place the size and type of ad widget you want on your website. You are then paid per-click and per-impression. I haven’t written an ebook yet, but I am hoping to finish my first one before summer of 2016. If you are an expert in an area or have something to share that you know others will read, then an ebook may be something you are interested in writing. There are quite a few people making thousands and tens of thousands of dollars each month from writing an ebook. Can a blogger make money writing for others? Lastly if you want to learn how to make money with a blog, your blog can also be used as a platform for other projects, such as for staff writing on other blogs. If you want to staff write for others, I highly recommend having a website of some sort so others can find your work and hire you. It's much more difficult to get your name out there without your own website. Staff writers usually start out between $15 to $25 per article, and as you gain more experience, you can usually command higher prices. I know some writers who are making thousands of dollars a month from writing for others, and it all started because of their blog. In fact, I recently secured a staff writing gig for $1,500 per article, which equates to around $2.50 per word. I never would have received this offer if it wasn't for my blog. 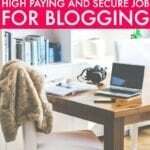 Are you interested in making money blogging? What other questions do you have for me on how to make money with a blog? If you are interested in learning how to make money with a blog, I created a tutorial that will help you start a blog of your own for cheap, at only $2.95 per month (this low price is only through my link) for blog hosting. In addition to the low pricing, you will receive a free blog domain (a $15 value) through my Bluehost link if you purchase at least 12 months of blog hosting. FYI, you want to be self-hosted if you want to start making money blogging. 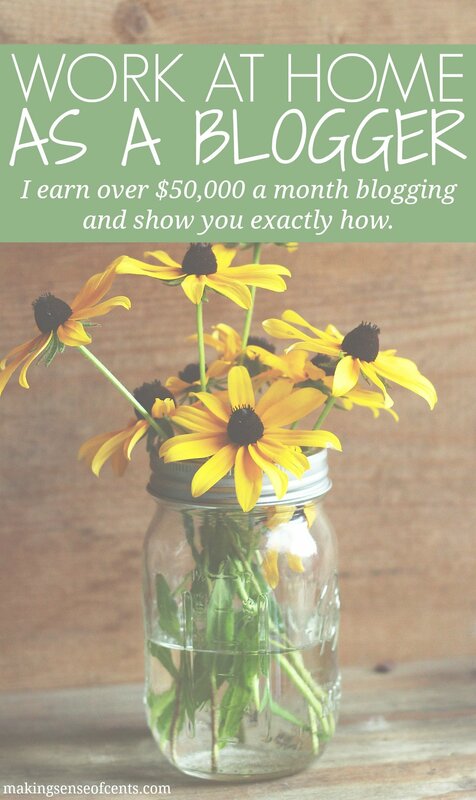 I keep reading posts about earning money blogging, and it’s very interesting! I always thought this was quite unrealistic and only for the happy few (with millions of readers each week). It almost seems to good to be true but on the other hand, there is quite a bit of effort involved. It’s not a get rich quick scheme. It’s definitely not unrealistic. I know many people who are doing great with blogging. Yes, hard work is needed. Everyone who starts a blog and wants to make money from it needs to understand that their blog has to be a business and from there you can learn the different income streams that are available to bloggers — but the most important part of your blog has to be good content above everything else! Yeah, blogging IS A BUSINESS. treat your blog like a business (even if you are deeply passionate about it and it feels like a hobby), know when and how much to invest in it and be consistent. Quality and consistency are the keys to success. I’m not sure that I want to monetize (I mean, it would be pretty great but…) because I want my focus to stay on teaching and tutoring. However, I am going to try to tackle Pinterest over spring break. Thank you for always being so transparent and helpful. Lots of details in here, Michelle! I agree with you that nearly anyone could do it if they keep going and never give up. It takes time! I am just starting to make a few dollars from Adsense which is pretty exciting! I want to work on scheduled Pinterest pins and maybe doing a few sponsored posts next if I can find some. I just switched to BoardBooster and highly recommend it so far 🙂 Tailwind is great too. Great tips! I have yet to focus on monetization but this information is very helpful! This might be a silly question but how do you know if you have content people would be interested in reading about? I would be interested in starting a blog but I don’t have some profound knowledge on a subject considering I am only 22. When you start a blog how did you know what your topic was going to be about or what you were going to focus on? You won’t know if people will be interested unless you start. If you enjoy reading your content, I’m sure others will as well. That’s the test I like to use. If you can’t even stand reading it, then you may have a problem, haha! Thanks for the response! I think I am going to try it out! Thanks for the tips. I appreciate that you share things that have worked for you. My blog is one week old, so I am definitely still a baby blogger, but I hope to be able to monetize at some point. Do you think there is a certain amount of time one should wait before monetizing? Like wait till there are so many people subscribed or following? Ok, Thanks! I’ll probably keep working on the first 2 then move to make money. I understand that having good content is the key, because if people don’t have anything good to read than they won’t come back. I agree 100%. The first should be content that readers would want to share. Then, move to marketing your blog. Then, you can start thinking of making money. Most often, though, we have the list in the reverse. We have the make money part first and get frustrated with the whole project. Like you said, blogging is not a get-rich-quick scheme. It’s a solid business model that can be worked over time. I was really worried when I started blogging because I read an article about oversaturation in the blogging world. I’m really glad I didn’t list to that article. You’re right – there really is room for everyone who wants to start a blog and monetize it if they choose to. Yeah, I think that’s crazy. There is so much room! This is such a great help, having all in one place. I would like to monetize and am working on organization and blogging course to help me advance to next level. Again, thank you! i forgot to ask, a lot of bloggers do Amazon affiliate, but I am in a state that is not allowed. What other avenue is there that has the same or better income strategy as Amazon? I recommend searching for products that you like and seeing if they have an affiliate program. I’m blogging for a year , and still it is only a side hustle for me and not the main income, there for I don’t give much an effort about it, just post once a week and get a few comments here and there from bloggers I follow. One day I will take a step forward and make it much as a business. Pinterest frustrates me so much, but I know I should get a handle on it. I think I may eventually hire someone that knows more about it because I have too much on my plate. I’m definitely making this article a point of reference. Thanks, Michelle! Last night I was wondering if you ever get bored writing articles on spec? 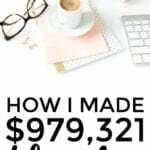 WOW I must say that this post is full of great information and I love how you have included such positive and actionable steps for people to make money with blogging. Through hard work and knowledge you created a post that will help people. I have been reading some other articles on this site also and you definitely show the expertise that is needed these days. I make money online through a few channels, having most recently started my blog I have yet to earn income from it, but one day I will with help like this. When I first started my blog, I decided to be self-hosted from the get-go and signed up with Bluehost. This was my way of keeping myself accountable – I knew that if I spent money on my blog, I’d be more motivated to consistently write. I’ve made back that $110 I spent (and then some! ), but even if I hadn’t made any money, that’s still pretty cheap for a hobby for a year! Kidding. Blogging really shouldn’t be about making money anyways. You write what you are passionate about, and people will come! Yes, exactly! I started my blog purely as just a hobby. I never expected to make money from it, and I think that helped me! 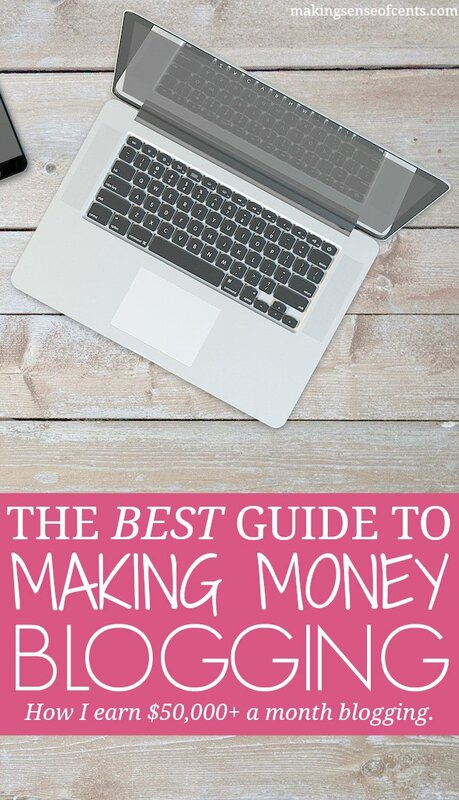 You’re weren’t lying when you said this was the ultimate guide to making money while blogging. Every beginner should take the time out to read this. This is definitely motivating – I’m working on increasing traffic to my blog in the hopes of monetizing it in the near future, and I love all your tips. Can’t wait until you publish your ebook/course on affiliate income! Once again, so much information and so motivating! For me, I think the hardest part is knowing if you have content that others want to read. I’ve been trying to write about the things that people naturally come to ask me about. Hopefully, out of the billions of people in the world…someone else wants to hear that too! Your posts are inspiring and filled with hope for new bloggers! Thanks! That’s a great way to create content. Have fun blogging! I have to say that blogging is very time consuming. As a new blogger I am realizing it takes time and effort to put together quality post. Then even if the posts are great, if you can’t drive traffic to them they are worthless. Thanks for this post, I will be bookmarking it for future reference. Yeah, it’s definitely not a get rich quick scheme. There’s a lot of work! I definitely wish I’d jumped on Pinterest sooner. It’s not the fastest growth in the world — partially, I’m sure, because I have so many posts that still don’t have images/pin-worthy images — but I’m definitely seeing dividends in traffic after only a couple of months. My blog probably isn’t seeing a huge explosion yet because — beyond the “give it time” thing — I don’t do a lot of “How to save money with X” posts. But still, I think I can expect traffic to keep rising as I get more old posts on my boards and circulating. Hopefully. Don’t forget that there are people you can hire to help you with Pinterest/Pinterest images. I don’t have the time/energy/knowledge to do the whole Pinterest thing myself. So I’m getting help navigating it and posting my stuff to make sure I get on the best group boards and such. It’s the only way I’ve been able to manage it. Yes, getting Pinterest help can be so helpful. There are so many great experts out there! What are the best affiliates to use? I always recommend to see if the products you already use have an affiliate program. Love your blog Michelle! Been an avid reader for a while, so much great info. You gave me the motivation to finally start my own blog last month, a huge personal goal for 2016. I can’t wait to keep learning more and hope to be as successful as you one day. Those income reports are impressive, plus you’re helping so many readers, very inspiring! Thanks for being so encouraging. Back in 2003 when I was really young, I started a blog but then I got discouraged because journalists that blogged back then said that blogging was an over-saturated field. I gave up and I wish that I hadn’t. Thanks for the tips Michelle. When did you, as a beginner, realize that your blog or your strategies were doing right? Hi Michelle! I really like the pics with titles that you have with each blog post. Are you creating these with picmonkey? I love that you said you earn that much through affiliate marketing! 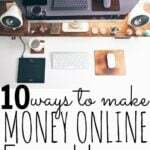 I feel like a lot of bloggers promote earning money through webinars, courses and ebooks. Those are amazing ways to make the money, but like me, I’m not into the whole webinar and course thing. I’ve been learning about affiliate marketing andnhoe to tie in the products with my own product lines! Love this post! These are great tips for blogging. I have started my blog but I don’t have enough traffic to start monetizing. Can you please help me out? First of all, great post. I can tell you’ve put a lot of time and effort into it! In response to your question about earning from eBook sales… I just wanted to also mention that there are many types of info products, not just eBooks and some are much more lucrative. For example, there are many online courses selling for $2,000+. You can also sell access to something like a Webinar or monthly access to a membership area. I’m gearing up to create my first course… eek! Thanks so much for all of the extremely helpful information. My blog is less than one month old and I worried about having a voice in a sea of other bloggers. Once I realized that we are all unique, I was able to focus on creating content without worrying if other bloggers were doing the same thing. Thanks again for sharing! I’ve recently launched my blog few days ago but do not know much about how to manage it to get more visitor i know it take time to get visitor to blog but how to derive visitor can you tell me little about this. i have a small blog i run and it has down well.My video channel is connected to each post i write a blog and create a video around it the description provided in this blog was free and that’s nice of the author shout out to Michelle with being humble many blessings to you ! Look at Perez Hilton he has done well for himself connection to your audience is key to scaling your blog and reaching the people you want to read your blog focus on a keyword and try to find a way to get ranked by using it 10% or more times in your articles and create a podcast or vlog face to face with image and embed into your content i have a niche based website in beauty and have 300K view in one month once i started focusing on keywords that matched what people are searching for post in groups like follow and engage with your readers i hope this helps and if your really want to take it a step further blog everyday and post to YT i seen a user who did this he has 100K users and just started his channel his name is the Last Harpy. Consistancy counts watch video creators and video influencers channels these tips do work and like the author they provide value content and deserve the accolades. Ranking for words that are not so high in competition is going to make more adsense if your using Google because they will target ads that connect with users what we do is use monetize on all platforms and we made on average $30 per month on YT with this case study we have a few channels we are testing because we have a few bloggers we help by posting on our sites to link share. I know this is alot but this is hard work to create one blog it’s alot of work we use WordPress and blogger and HD photos and because we use other domain rich keyword sites we use Google analytics to refocus on strategy monthly . It really depends on your title tags keywords and also how do you syndicate ? I do not pay a cent for traffic by the way fantastic post ! Great post! I’m a new blogger with zero followers yet and only two blog posts (I just started about 2 days ago) I was wondering, with affiliate programs, do I need to have a set amount of viewers to my blog before they’ll work with me? 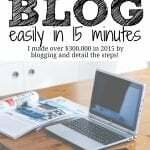 Do I need to have more blog posts up before I sign up with affiliate programs? Hopefully, I can gain some type of notoriety (for now it's just my good friends and colleagues) and earn a little bit back from this investment. I'm very new to the scene and your tutorials have helped me a lot. Just wanted to say, thank you very much!! If you have any free time between your busy schedule, please drop by my site and if you can, let me know if you have any advice! I definitely think the longer the better! HI! I just resently started my blog and I am having trouble increasing my revenue and trafficking! Please help!! So inspiring! I started my blog in April of 2016 and am tying to take off 🙂 also, a lot of great tips! I have been thinking about starting a (money making) blog for a while because it is a dream of mine to become Location Independent and travel. I don’t know what i have to offer for a blog though and the only thing i can think of, is the reason i want to start a blog in the first place was because i was predicted to carry the gene for Huntington’s Disease, so the blog might be more inspirational. Bucket list wise i really want to live and travel Europe but i cant ignore the fact i will need money later in life to care for myself. I guess my question is if i do choose that route for a blog, how can i monetize it considering i will probably not be plugging products? You could always just use sidebar and banner ads. Those are pretty passive and you’re not really promoting anything. Or, do you not want anything on your website? well yes i would like some way to generate income from it so i suppose i would have to have something. Thanks so much for the link.